It's a truly massive oak and we were starting a heavy retrenchment of side limbs incorporating fracture pruning in places, removed deadwood and take out a few elongated leaders and vertical growths from old wounds, it's a ongoing project to try and retain the tree. Looks interesting, that's the sort of job which make arb work a good day out. Not exactly true a straight stick will give you more lateral out reach and top height as you do not have weight in the boom for articulation. straight tele will have no projection of the turret into the carriageway if on highway work and can stay within the vehicle profile it also allows you to poke through gaps in telephone wires between branches and trees. you don't always need to go over most of the time you can reposition and get a whole large tree from 2 sides on reduction work and a tele can certainly get you under the canopy of a tree . i think size and weight are important 3.5 ton any body can drive it on a class b licence. tracked have their advantages but it's the transportation to site and set up time are factors. we have a 27 on a cabstar with m+s tyres on and it is good off road ,not a mog or landy but we have pvc groundboards if necessary and because of its low weight and relatively small size we can get it in. Different jacking configurations can make a machine more versatile too. on a 3.5 ton machine it's a comprise between articulating and top height if you want more than25m articulated then your at 7.5 ton upwards. for tree work your need up and over (articulated) for best results.the Nifty 17 metre was a bit lacking here but the Cela Dt24 has 14 metre up and over (12 metre) and also has the ability to go 4 metres below grade as well. Outreach is important especially when felling , nothing worse having the vehicle directly under the drop zone. I don't like spiderlifts but they do have their advantages. How come no-one has mentioned a spud box ratchet strapped to the pallet forks of a telehandler yet? Interesting viewpoint. Can you post some photos of yours in action. How much side reach does your 27m have. 27m on a 3.5t truck is big from what I can find on the internet. Straight booms seem to cost more though. 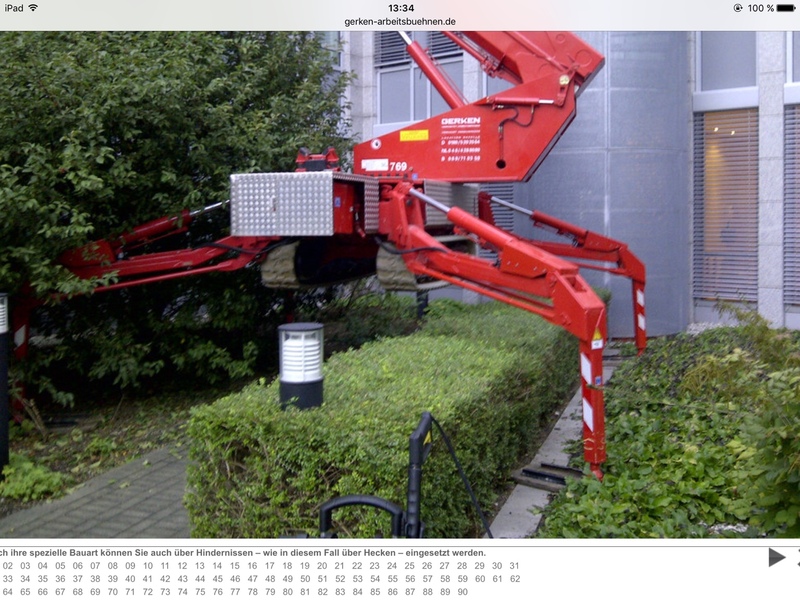 In case of Teupen like mine there is a €20k difference between the 24m like mine 25m straight boom. I'd agree that the advantage truck mounts have is set up time. Pull up in truck, legs down, tele boom out, crack on. Our takes 10-15mins to unload from trailer and then 5mins to unfold the booms (for most situations first one needs to be upright). 27m on a 3.5t chassis sounds terrifying. I used truck mounts extensively back when I was working in telecomms. A 22m machine would be on a 7.5t chassis. Most commonly used 34m Brontos on a 17.5t chassis. Occasionally used 60m machines which had a 42t chassis. Looked like a Dinky toy at full stick. That was £1500/day to hire back in the late '90's. Not really terrifying at all Mark we've had ours 6 years and it's not toppled over once !! ,good going really,they have just progressed with quality of steel and different bending profiling of the boom shape to give more strength with less weight we use ours as a one man machine which gives you maximum outreach of 15 m .
They are a quality German manufacturer Ruthmann who have just this year brought out a 29 m straight telescopic with 16m outreach on a 3.5 ton they also produce a 25m with a fly jib on a 3.5 ton with 16.4 m outreach . 3.5 ton is a huge market rental wise in Europe hence the competition and developments. I agree the old 34 m brontos we bomb proof but on 18 ton Ruthmann now do 33m on 7.5 ton with 22m outreach now that's a lovely machine but £160-£170k new.